Few songwriters have the gift that Jim White has. 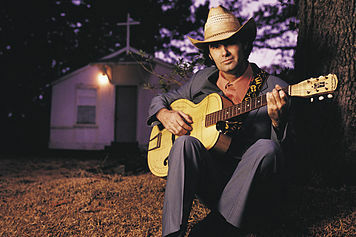 Channeling the strange and weird side of life into song-stories that are as compelling and moving as they are sometimes disturbing, Jim has helped push the Southern-gothic genre into music and back out into the limelight. His latest album, Transnormal Skiperoo, is a continuation and expansion on his familiar themes. Aquarium Drunkard: This is kind of a nebulous question, but what does the concept of writing and expressing yourself through writing mean to you? Everyone has a different reason why writing is important to them – what does writing, songwriting in this case, mean to you? Jim White: Well, I started writing songs to sort out a big mess in my mind. One of my teachers called it the ‘talking cure,’ what I was doing. I was just obsessively trying to work out when I felt I was going crazy, so it’s a form of self-therapy. What’s cool about it is I did it for 20 years without making any sense and then all of a sudden one day it started making sense. And not only did it make sense to me, it started making sense to other people too. People would say ‘oh, that song means something to me.’ So originally it was to trying to find my way out of some big psychological mess and there’s kind of been a transition. Now when I write a song, I think ‘well, how am I representing the infrastructure of my internal ideas,’ but I’m also thinking ‘how does this relate to other people and what will they have to add to the experience?’ So I’m sort of thinking about others at this point, too. Whereas before it was just like ‘how do I stop from going crazy? AD: Is that different? I mean, how does your writing change when you shift from just writing for yourself to writing for a dedicated audience? JW: Well, I started thinking about other people’s issues in their lives and tried to start documenting them. I have lots of notebooks where I write notes for songs down, or for stories. I do a lot of eavesdropping. I listen to what people have to say. If I hear a phrase or an idea or a problem that seems significant – that kind of resonates with me – I’ll put that in my notebook and later on I’ll try to explore the idea. Not just ideas that will be of service to me but ideas that will be of service to other people as well. AD: Is writing something you always enjoyed, or was there ever a point where, like in school, writing seemed like a chore? Was there a point where writing went from being an assignment to being something you enjoyed? JW: Enjoyed isn’t the right word. It’s something you sort of have to do. I remember I was on a panel at South by Southwest, and it was about songwriting, and a guy who was a musician who wanted to learn how to be a better songwriter raised his hand and said ‘what do you do if it’s a beautiful day outside and you’d rather just go walking – you don’t really wanna stay inside and write a song – how do you keep yourself inside to write a song?’ And I said ‘You don’t.’ If you would rather go outside and walk than write a song, you’re probably not a songwriter. You’re probably a guy who likes life. If you feel compelled to write, which it’s just a compulsion with me, I just feel like i have to say things – the hard part when you’re starting out is developing a vocabulary for saying what’s in your mind. It’s like Adam and Eve in the Garden of Eden. They were surrounded by a bunch of creatures and there were no name for them and they had to think really hard for a name for each one of them. If you can name the creatures in your mind, so that when they come and interact with you, you can say ‘that damn zebra just drove me crazy’ instead of having to say ‘that thing with four long legs and black and white stripes and long ears that looks like the other thing that runs through with the tail..’ You have to develop a vocabulary for your own set of issues and that’s the hard part. It took me 20 years of writing to do that. Things like tornados are really powerful images to me. And hummingbirds – for some reason hummingbirds are important to me. We were just listening to Tom Waits. He likes a chinaberry tree for some reason or – what did he call it? – it wasn’t a chinaberry tree, it was some kind of weird berry tree. You find your own little set of symbols that you can build ideas around and you sort of impose a value on them that is yours, but they have a value in the world, too, and hopefully the values coincide. AD: So, is there a dedicated process you have for writing? Stephen King has talked about, in his writing, he sets aside a time each day to sit down and write. Do you have any sort of regimine to your writing or is it something like The Rime of the Ancient Mariner, when it comes over the guy, he just has to do it right then? What’s your process? JW: Well, Pat is a disciplined writer. He gets up at 4 every morning and writes for how long? Pat Hargon: ‘Til the baby starts crying. JW: ‘Til the baby starts crying at 6 or something like that. I’m not like that at all. I’m just stealing moments whenever I can because at this point – I’m a musician for a living – and basically you’re hustling every minute of the day to figure out a way to stay alive. So in the last two years I haven’t had much of a chance to write. But it’s ten o’clock at night and I’m not sleepy? I might write for two hours before I go to bed, or I might wake up in the middle of the night and not be able to sleep and go work on a story for two or three hours, or a song. When I have an album coming out, it’s more complicated because there are deadlines, so I will sit down and say ‘okay, this morning I’m going to start at 9 o’clock and work on a song.’ It’s not like you write a song in an hour or a day or a week – one song took me five years from beginning to end to write and spent hundreds of hours working on it. AD: Which one was that? JW: “Static on the Radio,” which was my most successful song. [laughs] There’s some correlation perhaps. Maybe I need to take five years.. Audience: Well, I would hope it’s successful..
JW: No, it’s not necessarily true. You could take five years writing a song which is a complete failure, but from that song all kinds of things can come out which will be successful. You have to fail and fail and fail before you succeed. If you expect to succeed right off the bat, you won’t. Very few people have that kind of writing skill that they can just sit down and write. Most times you have to write crap for a long time before – you might write a hundred pages of crap and have one line in it that’s good and you take that one line and you apply it somewhere else – to another hundred pages that also had a good line and you put those two lines together – it’s a hard route – I don’t know if it’s that way for Pat. PH: Well, one thing that comes after writing for a really long time is the ability to recognize when you’re writing crap and when you’re writing something that’s good. And the thing is that you don’t always notice that when you’re in the act of writing it – you develop the ability to revise, you develop the ability to go back over and sift out the good stuff from the bad and I think most professional writers will say something along those lines. When you just sit down and look at the blank screen, you don’t furrow your brow and awesomeness just appears on the screen. You develop techniques that work for you, you develop some sort of system. With me, I can just work for a certain amount of time per day and that’s my system and I try to devote a certain chunk of that time to just generating raw material and the rest of the time I spend shaping that raw material. If I just think of it in discrete stages like that, I don’t feel anxiety when I look at the screen and nothing good is happening. AD: Jim, I know that you personally have done a lot of different things over the years, even before you were a musician and Pat, I imagine you wear a lot of hats as well, having a family and – well, both of you have families – how have the subjects of your writing changed? We talked about how the subjects of writing can change when you go from writing for yourself to writing for an audience, but what about in stages of life? How have subjects changed for the two of you? JW: Well, you know, at a certain point I had this solipsistic path where I was just thinking of myself for years and years and trying to figure out who I was and why I was so unhappy and once I got that worked out – I have a family and two kids, I feel like I belong in the world – so of late I’ve been trying to represent how I belong in the world. What’s funny is I have like 20 years of writing about how I don’t belong in the world, and once again I’d developed an extensive vocabulary — it’s like how Eskimos have 500 words for snow, you know — well, I had 500 words for ‘gee, I just feel sad and lonely.’ Now I feel happy and I feel at peace with myself and I have very few words to describe that, so I’m trying to build up a similar vocabulary of meaning for the positive parts of the world and experience. PH: Well, with me, one thing that’s changed over the years is less interest in really esoteric stuff that doesn’t mean anything to anyone except for me. Like when I was in graduate school for creative writing, I was really preoccupied with writing arcane, esoteric stuff that only I would understand and that would somehow preserve it from the prying eyes of the audience. That kind of thinking doesn’t really make sense to me anymore. I’m more interested in trying to isolate some kind of image or phrase or something that’s going to have some kind of emotional resonance that goes beyond myself. I think that’s what writing is, at least at this stage in my relationship with it. Once you make a commitment to a long-term process like that, your relationship evolves — with me, when I write something that I feel can go beyond myself, then I feel like I’m doing something good instead of just working on different ways to rephrase things that don’t make sense to myself. That’s not fun at a party or..
JW: Yeah, they call that navel gazing. Where you’re looking at your belly button because you’re just obsessed with your belly button. Sooner or later it’s good to look up from your belly button and look at what’s around you. AD: Both of you work in what we could call the genre of songwriting — there’s a certain style to songwriting that differs from novels — looking at the influences that have affected you over the years, would you say you were more influenced by other songwriters or more by prose writers or poets? JW: It’s really hard to ferret out one or the others. Things hit you hard. Flannery O’Connor hit me hard. My friend Jimmy Tuck hit me hard. He’s a crazy, redneck haz-mat driver. I spend a lot of time around him just thinking his whole life is a creative story. He doesn’t have to write it down. He goes to the zoo. He’s really good friends with an orangutan at the zoo. And he smuggles in Camel cigarettes and when no one’s looking, throws this orangutan these Camel cigarettes unfiltered which the orangutan eats and the orangutan likes it. Tom Waits had a big affect on me in terms of representing sort of — I write about the underbelly of the world. You know, I don’t write about going to the mall, and stuff like that. I write about the tow-truck driver who gets your car from the mall and steals your tires. It’s a big mess of things and it’s really important if you’re a writer — I really strongly recommend this — carry a notebook with you and write down anything that you see that seems to have value and learn to recognize — it’s really important to learn to recognize — if someone says something funny, write it down. If someone says something sad, write it down. And then when you’re writing your stories, look at those things and remember why they created a response in you. Tom Waits is one of my favorite writers — he’s a very influential songwriter – y’all don’t know him because you’re too young — but every body in the music industry is affected by his work both as a musician and a writer. I saw him once. I almost served him lunch. I was working at a restaurant in New York City and it was kind of a frou-frou restaurant and he writes about kind of rough and tumble things and I would’ve been very disappointed if he’d ordered quiche. But he walked out of the restaurant after refusing to order anything because it was too frou-frou and started talking to a homeless guy I knew. And immediately whipped out his notebook and started writing down the conversation. The homeless guy thought he was Hank Williams’ son. He was crazy. He lived on a diet of black pepper and rubbing alcohol. That’s all he ever ate. He was therefore very lucid in strange ways – he said really weird things. And Tom Waits just wrote and wrote and wrote. Talked to him for about 25 minutes. So get yourself a notebook and write down the things you observe in the world. Unless you’ve got a great memory and can remember things. My wife can remember anything anyone says to her. I forget, so I write everything down. AD: On your first record you included, in the liner notes, the story that the album’s name came from, “The Mysterious Tale of How I Shouted ‘Wrong-Eyed Jesus.’” Have you done a lot of short story writing? If so, have you thought about releasing a collection of them? JW: I write short stories when I have the time but it’s a long slow process. To write that short story in ..Wrong-eyed Jesus, I wrote for a month and a half, just every day, 8 hours a day and it’s only a 14 page story, not that long. So it’s a real arduous process. Yes, I have a bunch of short stories I’ve written and I’m going to put them out one of these days. I had a deal with Norton Books, which is a really big, important book company, and it was a big honor. They said ‘yeah, we’re going to publish your stories.’ And I said great, well, let’s talk about it. And they said ‘no, you just give us the stories and we publish the stories.’ And I said but, but, but. And they said ‘no, you just give us the stories.’ And I thought about it and I said, well, I really need to talk about it and I want them to be better than they are and I want to help design the cover and do some things like that, and they said ‘no, you just hand us the stories and that’s it.’ So we just decided it wasn’t a good idea. So I have a writing agent in England and I send her my stories from time to time and we talk about where they would fit. I have a novel half-finished; I have a feature film half-finished. I just haven’t had time to do any of it. You live hand-to-mouth as a musician, you don’t make much money, you just barely get by. And I’m hoping at the end of the touring, which will be in a few weeks, I can concentrate on the writing because I think I enjoy it most. I like the solitude of writing. I just like sitting and working with ideas and moving them around. AD: The film is just something you have going on, or this is something you’ve talked with people about doing? Pingback: Listen to Jim White. « Hello! Jim White is an amazing guy. Thanks for publishing this, it’s really interesting and useful piece! Wonderful study. I recognized your internet site from a google search, and was glad i did. The data has aided me immensely.